1.1. 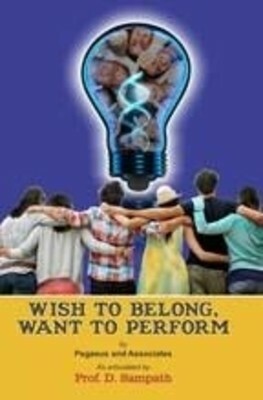 Prof. DSampath’s Book ‘Wish to Belong, Want to perform’ is a refreshingly unique book on management principles. It is an unusual attempt, in many ways. It deals with layers and layers of intricate management operations, the nuts and bolts of management machinery; but more importantly it goes beyond these and delves into the very heart of a company – the people who make the company, manage it purposefully, run it efficiently and enliven it with their vibrancy. 1.2. Making a Company work successfully is more than ‘work’. Each one – the leader, the manager, and the employee – brings along with him his own interpretation driven by his own necessities, his own priorities, his own objectives and his own hopes and expectations. It is the synthesis of these dreams, aspirations, fears, commitments of the people who participate in its operations , with a sense of belonging , at all levels , that truly drive the Company along the right path for the good of all. A well working Company is the fruit of the harmonious blending of the ideals, the expectations and efforts of the core leadership , the managers and the employees even at its periphery. The wellbeing of a Company is in its internal harmony; and is also in its harmony with the well-being of the community at large and the environment that surrounds it. A successful Company is the fulfilment of all – within and outside of it. 2.1. Having said this let me also mention that the Book does recognize the fact that a Company is there basically to do business. A Company is essentially interested in getting a job done, and that done well; as well as it could possibly be done. That is to say that a Company has a corporate-mind; and, its behaviour is plainly economic in orientation. A business organization has to be focused on profits; and ‘profit’ is not a bad word. Profit is an index of a company’s health, the soundness of its strategies, and its acceptance by the community. And, it provides the company the strength and resources to develop, research and to reinvent itself. The question the Book raises is about priorities. Is profit the only value in business? In case that is so, then the company could turn very shrewd, callous, cold-blooded and indifferent to integrity. It could also lead to conflict between the managed and the managers; between the company and the community. The Book therefore suggests that ideally profit could be viewed as a means to an end; as having instrumental value. 3.1. There is an air of positive longing that pervades ‘Wish to Belong, Want to perform’. It looks to the future and to the next generation of leaders, managers and workers with hope. It urges them to create a vision with values which provides space and opportunity for the enterprise of all the participants to flower, allowing them to grow, to express themselves, to realize their aspirations; and, at the same time to seamlessly blend with the Company’s healthy growth in achieving its goals. The balanced interdependence amid the employees themselves and the Company as a whole is the true lifeblood of the Organization. It is this vibrant culture that Prof. Sampath and his team cherish. 3.2. An endearing aspect of the Book is its readability. The various intricate management issues are lucidly discussed and analyzed in the form of narrative stories, anecdotes, and conversations between the Professor who is the leader and his young associates. The discussions follow an interesting pattern. One of the associates raises dissent disguised as questions; the other associate comes up with half-answers to those objections; and, finally the Professor rounds off the discussion on the issue offering explanations and a satisfactory conclusion. [ That reminds me of the narrative pattern of Patanjali’s Mahabhashya , which is composed in a conversational style employing a series of lively dialogues that takes place among three persons: Purvapakshin (who raises doubts); the Siddanthikadeshin (who argues against objections, but only provides partial answers); and Siddhantin (the wise one who concludes providing the right answers) . Its method is engaging, dotted with questions like “What?” and “How?” posed and resolved; introducing current proverbs and references to daily social life. At another level the conversation could as well be taken as a dialogue between the author and the reader. The ‘Interludes ‘at the end of each chapter, following the main presentation, I find are the most fascinating and engaging parts of the Book. These are, in effect, dialogues with the readers to discover ways of humanizing the Organizations. The casual readers as also those who have grown grey in the maze of management can enjoy and find something to reflect upon. 3.3. The group discusses the working practices of some selected successful organizations based in India and other multinational companies. The discussions are rooted in the vast experience, research, deep understanding and insight that Prof. Sampath has gained over the years as Manager, teacher and mentor. It brings focus on concerns that relate to the Organizations’ leaders, managers, the customers, the employees and the surrounding social systems. The bouquet of the selected organizations is spread across a fairly wide spectrum of business, social and educational institutions. It also covers Government bodies at the other end family business houses. As the authors put it: The idea was to study organizations that had, besides profitability, ideology and community orientation as the main focus. We wanted to research those organizations which visualized themselves not merely as economic entities, but also as viable communities with a distinctive worldview. 4.1. The message of Book, as it appears to me, is that: The success of an organization depends on the cohesive groups of people as also on its core that provides the organizational environment, values, vision and social goals i.e. the leader, the entrepreneur and the team managers. The harmonious relation between the groups and the core creates vibrant feeling of oneness, charges impetus for action and opens fresh perspectives for further growth. This identification gives the employee a sense of belonging which promotes a harmonious feeling with just not a task group but also with the interrelated social collective. In these helpful circumstances the possibilities of personal and organizational goals coming closer are higher. As the Author put it : This book is more about creating an exciting ambience in the workplace that facilitates an employee to perform and identify with a sense of belonging to the organization, concurrently enhancing his well-being as a person. And , that an organization is not merely a place of work but is also a social community. 4.2. The Author and his associates have put forward convincing arguments for why a company must consciously attempt to integrate its task and social systems , foster human connections inside as well as outside ; and, how it would lead not only to better results but also to preserving the happiness and commitment of its employees. The book aims to bring forth the value of fostering social and task connectivity, energizing strong themes for identification and belonging; and, the importance of bringing about dynamic changes in the internals. These measures do ensure maintaining a very high calibre of professional task orientation and nurturing an energetic organization culture. 5.1. To me, personally, the Book has a special interest. It touches upon some subtle but elusive issues that are usually glossed over in the traditional or typical Management Books. Some of these issues have been buzzing around my mind; and, I have not been able to articulate them candidly. That is mainly because I have been, for a long-time, away from the field of happenings. I was delighted to sight some of these speculative concerns surfacing in the Book. 5.2. For instance; it was interesting to read the debates that skirt around the questions whether there is a link between organizational wellbeing and community wellbeing? How wise it is or how far can a Company go in mixing business with community welfare? Whether there is a thing called ‘corporate conscience’, where does it reside, is it different from merely complying with legal obligations etc. There is also the uncomfortable question: whether there is a place for morality in business? Is ethics different from business-ethics? There is also a question of the limits of internal democracy, non-judgemental space for expressing ones opinions, or for socializing in the business ambiance. And, whether an employee is valuable merely because he has stayed with the Company for a long time? And, in the present-day multinational, multi-cultured work atmosphere is there a meaningful place or relevance for ‘cultural homogeneity’? 5.3. ‘Wish to Belong, Want to perform’ may not have provided a panacea to all the management concerns. But, it does surely make an honest attempt to look at them in the face. Let’s quickly glance through just a few of those issues. 6.1. There is an interesting stream that runs through the Book. There are references to links between organizational wellbeing and community wellbeing; as also to organization working in harmony with the community. The Book believes it is essential for an organization to link harmoniously with its extended social and task systems. It dwells on the idea of enrolling the community as a partner, be in harmony with the environment, create an environment where the community joins in. That, it says, is important for growth of the individual as also for the group. That ambition, truly, is both fascinating and challenging; it steps onto an explosive field. The Author does not deny or turn blind to the harsh reality that there would always be conflict of interests between individual and organization; the organization and the community; as also between individuals, groups and the State. All these have several facets of relationships. And, many times, it might so happen that the conflict is not between the good and the bad; or between the right and the wrong; but between two rights. Ultimately, it is a question of priorities, feasibility and maximum good with least damage. The dynamics of the situation might also be rendered more complicated by interference of agencies not directly involved in the process. Organizations ought to foster… creating a wholesome identity where employees can identify with the organization and derive meaning from their association… Ideally, an employee’s set of values needs to be convergent with the organizational values. 6.3. As regards its links with community at large the Authors strongly believe that the organizations which survive and grow need to have a strong core and have a harmonious relationship with the extended task system and the community. Ideally, an Organization should have the community as its partner. 6.4. How does one wade through such maze of mutually competing priorities. There are, of course, no ready-made answers. One has to be guided by wisdom, faith, an understanding heart and lots and lots of patience. The Book attempts to look at the very essence of interdependence between internal and external, between roles, between people and the world view around it…how enterprises need to focus on processes which supports interdependence. This is the main theme of the Book. And, it aims to provide means to achieve these desirable goals. 7.1. The Book believes: Like every individual, organizations too have an identity. It implies that a corporate body has a personality of its own; and, can act like a person. Highly interesting speculative discussions, elsewhere, revolve around the question whether a corporate could be said to have conscience. The term conscience here for the limited purpose of discussion could be taken to mean a sense of moral responsibility an individual is required to have as a person and as an entity of the organization. Whether an aggregate of such individual ’conscience’ amounts to collective or corporate conscience; or whether it is of a totally different nature which might perhaps include inbuilt elements of self-control, integrity and a sense of concern for its employees and the larger community. Whether such a balanced internal control system could be called corporate conscience? In which case, does an industry have moral responsibilities beyond legal compliance and their obedience, in addition to commitment to its shareholders? 7.2. The related question is about ethics. Ordinarily, ethics in business management is taken to mean compliance with the legal requirements, to steer clear of legal hurdles. Does this morality or amorality in business have a place for ethics? It seems ethics in business is distinct from business-ethics. It is perhaps hazardous to carry ethical convictions too far into commercial ventures. Besides, there are no uniform standards of ethics, globally. It is often a function of the region, culture, social structure and even of religion. 7.3. Ethical conduct invariably involves self-control. In the case of a business organization it might imply being critical of its own actions and attitudes; and, be conscientious while designing a product, providing services or dealing with the community. Self-management and ethics – both involve judgment of values such as what is to be pursued or sought after; and the judgment of obligations such as what requires to be done. The power in the corporate body should be tempered with consciousness. That becomes easier when there is degree of freedom within the Organization. It is perhaps here that internal dialogues and effective feedbacks play a vital role. 7.4. Yes; ultimately, self-management or self-regulation is a more effective form of control in corporate activities. But, who sets the tune to Company’s operations? The moral responsibility of the Company is usually pinned upon its top executives rather than on its other components. The fortunes of the Company too depend to a very large extent on the foresight, skill and honesty of its top executives. At times, the very name or presence of the core group leaders evokes image of the Company. To put it in other words, any business Company is seen to acquire an effective front through its main executives who are identified with the Company. Having said that, it might be incorrect to identify the Company with few individual however important they might be. Ideally, it is essential that a sense of responsibility is shared by each of the employees as a person and as a worker. Vibrancy of an organization begins with a strong person or set of people and engulfs the leadership team. The core team creates a composite of their vision, values, practices, and perspectives for energizing the group through role modeling, personal interventions, and also actions; this spreads across the organization through continued practices and traditions at varying degrees of intensity, focus, and content. “Organizations have to articulate the way the work is to be done and the way organization culture needs to be built, and create constant communication mechanisms and consistent practices to convey it to the employees”. “The style of management determines learning process in organization development. Learning in organizations is continuous control over experience transformed into accessible knowledge for the benefit of the organization. It involves competence and knowledge-management “. Therefore, ethics and ethical conduct in an Organization is a shared responsibility. 9.1. The Book raises a topical issue that is of great interest in these days of multi-national, multi-cultural work places spread across the globe. It observes that in an Organization “Culture homogeneity of people and inducting them to both social and task culture becomes important.” The question is ; how do the factors of ‘cultural homogeneity ‘meaningfully operate in a multi cultured organization, let’s say in TCS located in Cincinnati OH having a mix of local Americans, Hispanic and Desi Indians. It is obvious that sets of people from diverse cultures with different values would find it difficult to create a common social culture, though they may create a professional task culture. I believe ‘culture’ in the given context could be taken to mean an organizational culture with its own set of values and objectives that are shared by all its components regardless of their regional or cultural backgrounds. It may also include inspiring mutual confidence, respect for individual, wide communication which accepts honest mistakes, mutual support and stress on continuous learning. Certain cultural homogeneity is essential, and the rigor applied in the selection of people determine the quality and sustainability of the culture. There is a need to induct people into technology, philosophy, and culture, and also into the practices of the organization to seek alignment in task as well as social behavior. It is in this sense that Cultural homogeneity of people and inducting them into both social and task culture become important. An organization can create a context which helps in fostering an atmosphere where people are connected as a social community, looking for togetherness and well-being, and also connected together as a task group focused on results. It can also configure ways of bringing in the outside realities seamlessly within the system. This creates a connected organization. 10.2. Perhaps the desired stress here is on a work- space where people come together through social interaction, social learning and networking’; and experience a ‘feeling of togetherness’. I, however, reckon that striking the right balance between professional – task approach to work, and the informality in workplace is a delicate task. It is essentially a matter of good judgment and restraint. And, that needs to be honed with skill to ensure to arrive at a right mix of comfort and work-discipline. I also feel, it is a task that is best monitored by the Group Leader in each unit at the basic level and the senior in charge at a higher level. It calls for experience and sound commonsense. 11.1. Prof. Sampath is an expert in the studies on Family-Business houses in India. The magazine Family Business Review mentions him as one of the leading family business consultants. His views on the subject are therefore treated with much respect. His book Inheriting the Mantle by Sage Publications is one of the few books published on Indian family business; and, it is adopted as a textbook by some teaching institutions. 11.2. In the Book ‘Wish to Belong, Want to perform’, Prof. Sampath explains: “Family businesses and the long-standing organizations have ways of pursuing both economic and collective goals simultaneously by devising two different structures for managing them. This concept of two different objectives is driven by two different structures and final decisions are the result of deliberations and negotiations. 11.3. I however find that in the Family Businesses, the levels of motivation and dedication as also the quality of approach and attitude of the first generation of enterprisers towards their business markedly differ from that of the subsequent generations. The latter somehow tend to take lot of things for granted; and their attitude to business, business-methods and goals are far removed from the intentions of the founding fathers. The later Family-establishments also tend to dissipate and breakaway mostly because there is neither a sense of purpose nor pride of achievement. 12.1. Now, there are frequent references to persons staying with a Company for long years and being satisfied with their placement and performance. It is rightly projected as a symbol of the virtue of both of the employee and the Company. The arguments in favor of loyalty and steadiness are well accepted; and, the value of their services rendered is never denied or discounted. But, it also points out to the harsh fact that such long-lasting employees, in the middle level, would generally not be able to notch up their creative responses to new challenges. Whenever a situation presents itself they tend to dig out of their past experience and try to apply the same solutions to same or similar situations. They may have lost the urge or the sharpness to think ‘out of the box’. The creative aggression seems to have lost its edges and might be fading away. 12.2. Next, is the mirror image of the above issue: that of the employees changing Companies or jobs periodically for verities of reasons. Now, each time a person changes his Company he does strive to adapt well and quickly to the new work scenario and to the new work-culture. And, he does attempt to perform his best in each of his new jobs. That is to say, he learns to survive and prosper by proving his usefulness in varied environments. He is tested in ‘Discomfort Zones’. As the person successfully migrates, say, from Company One to Company Three or Four he would have moved up the scale and honed his skills and creative responses. I understand that some of the recruiters do look for those tested in “Discomfort Zones’. 12.3. Having said this, the issue needs to be placed in proper perspective. Just as a ‘job-for-life- loyalty’ is no longer valued as a virtue in the present-day business world, the frivolous ‘company – hopping’ too is not viewed with favor. The tendency of Job-changing and creativity is not an arithmetic relation. It is context-sensitive and should be endowed with a sense of balance. The Company needs to look for a judicious mix of experience, expertise, stability and enterprise. 13. ‘Wish to Belong, Want to perform’ is the fruit of wisdom and Love. It is a Book for the future; and for the entrepreneurs and for the managers; and, for anyone genuinely interested in leadership, management or organization development. The authors have attempted to provide a fresh perspective for building vibrant organizations having a set of values, through its work culture and social culture. They firmly believe that creation of creative interfaces within the organization and with the environment is essential for the healthy growth of a Company. It longs to foster in the individual a sense of belonging, and identification with an organization. It asserts that Organization development is scarcely possible without ensuring the development of individuals; and, that the wellbeing of the Organization and the Community are related. I wish the well written Book is avidly discussed in the academic circles. More importantly, the main aspirations of the Authors need to be turned into reality by putting to practice their recommendations.